The days are definitely cooler now. 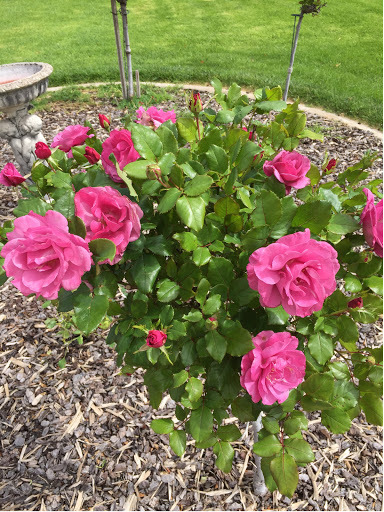 My standard roses are giving a final flush. We did a quick trip to Adelaide on Tuesday so Gus could deliver 3 vehicles then back Wednesday. 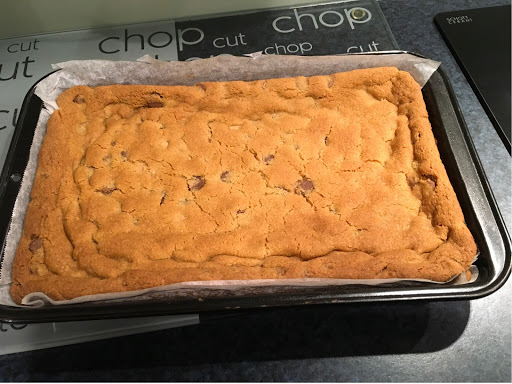 I made choc chip cookie bars for my girls. 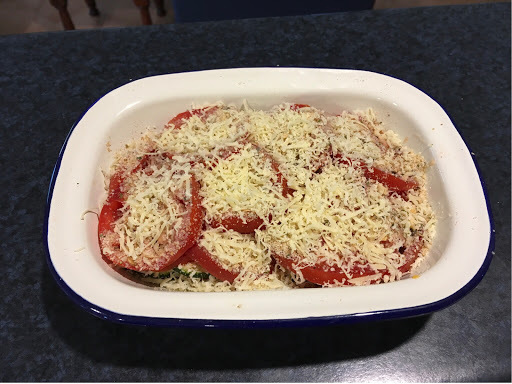 I've been given some more tomatoes from my bro-in-law so I made a little tomato and zucchini bake for dinner last night. Then I chopped up all the rest and zip lock bagged them (sucking out the air with a drink straw). These will go into the freezer to make future bakes or be thrown into soup or a stew. 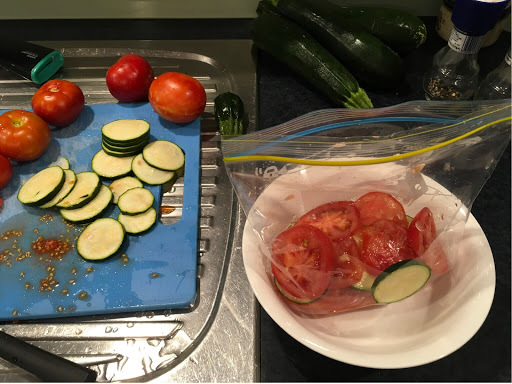 I love the taste of fresh grown tomatoes - hot house grown ones just don't compare. 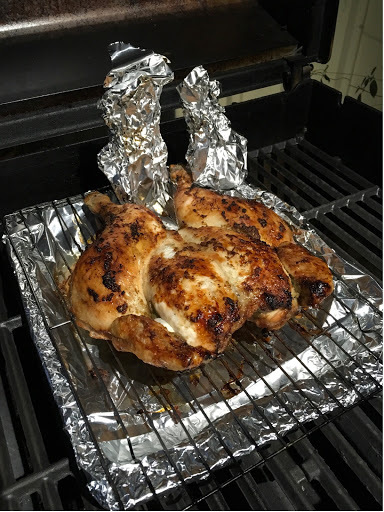 The picture of the splayed out chicken was from dinner Sunday night - Thai marinated a la Gus! It was delicious! As I said, it's getting cooler now and it's definitely time for Daylight Saving to finish. I love snugging in when the weather gets cold. We had some really heavy rain last night, so loud on our roof that I couldn't hear the TV! Poor Queensland is copping a beating, first with cyclone Debbie and now torrential rain which has historically closed schools across the SE of state due to safety concerns. Unheard of! I hope the weather is better for the weekend as we are off to the footy! I made another 5 strips in relatively no time! The worst was sitting and laying out the fabric strips then cutting them to size so they randomly form a brickwork pattern - ish! After that, I packed it up as my back became sore from getting up and down from the floor and leaning over. I don't want to undo my Bowen therapy session I had this week! I'm pleased with how it's coming along! Cook off until all tender. Serve topped with the tomato salsa, sour cream and mashed avocado. I loved this for a Friday night. The parcels can be made earlier then heated when needed. Delicious! I rarely use a packet mix in my cooking nowadays but every now and again I want some inspiration and something quick. I bought pork mince and some mushrooms and was good to go. When it came time to assemble the meatballs I though, I wonder how some grated apple would go in them? Pork and apple are a match made in heaven, right? So I grated a peeled apple into the mince mix. The result was very tasty, light and tender meatballs and the gravy that the packet made was delicious. I may just use this flavour sachet again sometime. 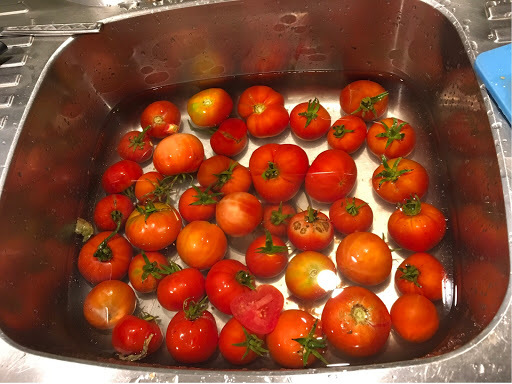 My brother-in-law dropped off these lovely ripe tomatoes so I'm making pasta sauce to freeze for when I want to make spaghetti bolognese or a lasagne. No nasties in this sauce! So far, I've skinned them and pureed them in my food processor then tipped them into my slow cooker bowl. When I get home from work, I'll add onion, garlic and herbs and slow cook it tonight for several hours. 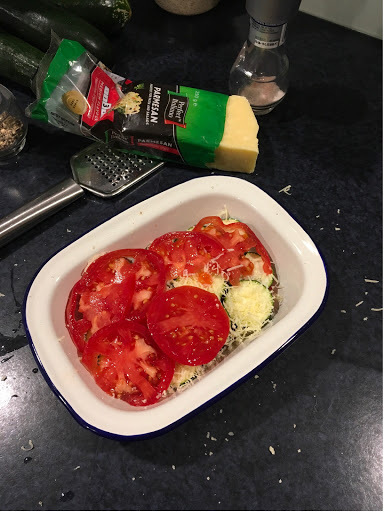 I should get 4-6 containers of lovely pasta sauce to which I'll just need to add mince to. (I didn't fry off the onion first, I just put it all in the slow cooker from 5pm until 10pm, stirring on the hour). Into the freezer they go, to be used over winter when fresh tomatoes can't be found. I'm looking forward to a nice bowl of spaghetti bolognese! 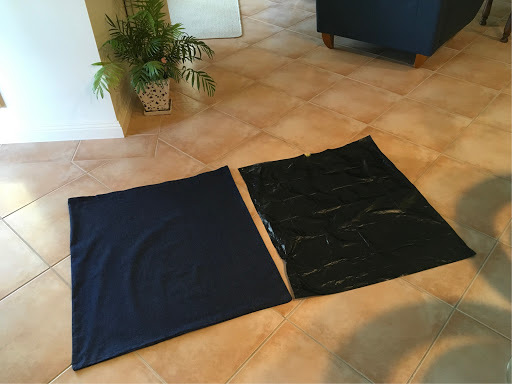 After completing that fabric bag on Saturday, I had plans to knock up another smaller one to house our green floor matting which is always dirty when we pack up. Gus loved the other one. I fired up my poor Sally sourdough starter and this took all day Sunday to get her bubbling. I left her overnight and by Sunday morning she was lovely and bubbly! I mixed up a dough and left it to sit. I wasn't sure how long it would take to rise. This was taken at 8am. I hadn't bought any bread for the weekend so I made a batch of scones for breakfast. Cheese and herb with a touch of cayenne pepper. I gave the bread dough a flip and turn at 10.30am then left it to keep rising. I had a phone call just then to invite me to a market day with some girlfriends and to meet there at noon. Why not? So I quickly peeled and got the quinces I'd been given, on to boil. That other fabric bag will have to wait! Cooked until tender, I then drained them and pureed them in my food processor. I got 7 cups to which I added 6 cups of sugar. Sssshh! Then I popped it in my slow cooker bowl, covered it and let it cool. No time to cook it now, I'll do it later when I get home. We had a lovely lunch at a local cafe and a wander around the stalls. I bought some lovely local honey and some plum and pear paste and some little cherry tomatoes. ...and this great loaf. I was well pleased with that! I got the quince paste on at 4pm and although it's quite labour intensive, stirring every 15-30 minutes, it came together and I had it finished by 10pm. Being in the slow cooker, you don't have to be standing over it all the time. Once cooked, I popped it in these little containers and it should now keep un-refrigerated quite okay, in a cool, dark place. I'll be giving most of it away. 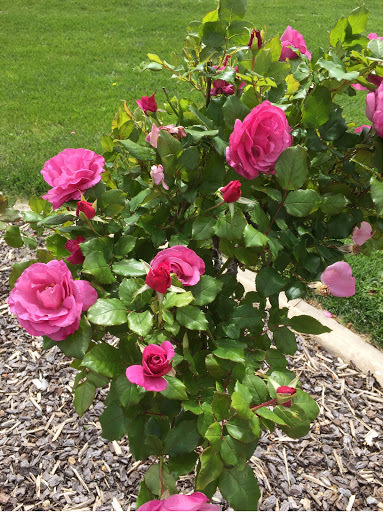 I keep dead heading my roses and they keep producing more buds. 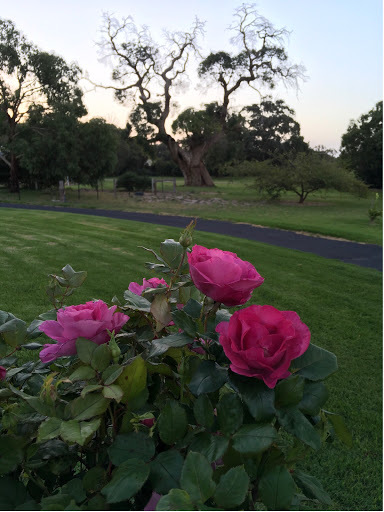 I'm loving my Soul Sister rose. My other standards are likely to give another flush also. Well, that's my weekend, was yours as busy? We pack a lot of stuff in the back of our Defender and I hate it when things get marked and scratched, especially if we pack up in the wet and things are also dirty or muddy. 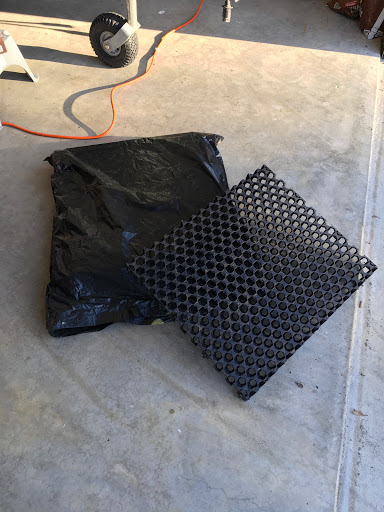 I recently bought four of these mats that interlock together. If it's been raining and you have a puddle at your doorstep, you put one (or more) of these babies down and you will have a dry entrance and won't track mud into your camper or caravan. When we used these last weekend in our shower tent, they were brilliant for that too. Water just runs away underneath them, unlike the rubber foamy type mats that seem to trap the water underneath. I needed something to store them in as I could see that using a black garbag each time would be costly and bad for the environment. 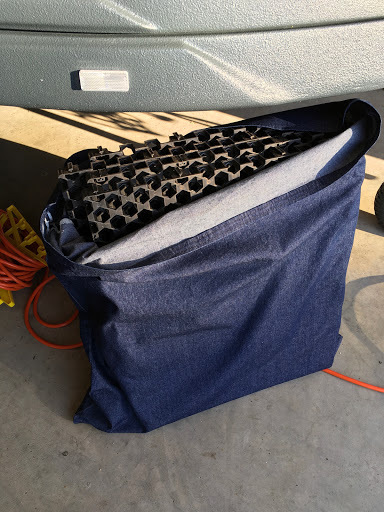 I bought some medium weight denim fabric, for durability and just made a flat bag the same size as the garbag. I was going to put in a draw string but it just folds over at the top. Here's the finished bag with the four mats inside, ready to throw back in Ruby. They won't rub against anything and if they're muddy, I can just give the bag a wash when we get back and we won't be wasting plastic bags. Win, win! I'm pretty pleased with myself!